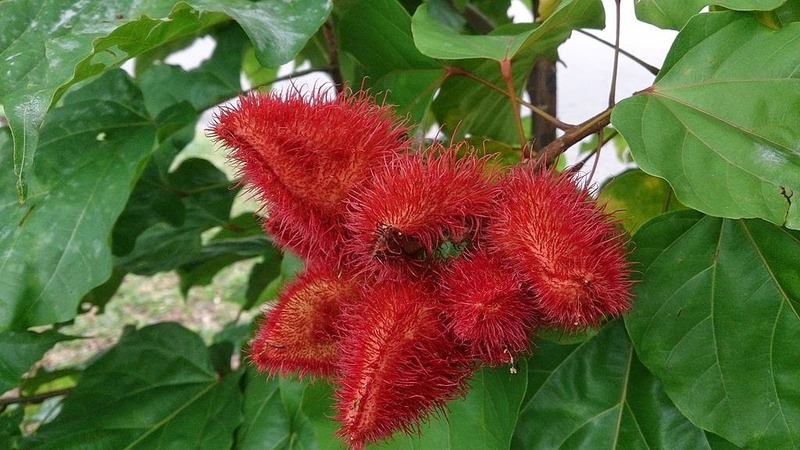 Kesumba, Latin Name: Bixa orellana L.
Description of the plant: Plant shrubs, 2-9 m tall, single-stemmed leaves have long, oval shape, pointed tip, flat base sometimes heart-shaped, flat edge, 8-20 cm long, 5-12 cm wide, and mottled green color red. This plant flowers pink or white, 4-6 cm in diameter. The fruit such as rambutan fruit, covered with hair brush dark red or green, flattened, 2-4 cm long and contains many small seeds scarlet. Chemical Ingredients: Tannin; Calcium oxalate; saponin; fat; glucoside; resin. Kesumba leaves 15g; 30 g sugar; 500 ml of water, boiled for boiling for 15 minutes, Drunk in the morning and afternoon. Kesumba leaves 10 g; 400 ml water, boiled until boiling for 15 minutes, 3-4 times a day Drink.